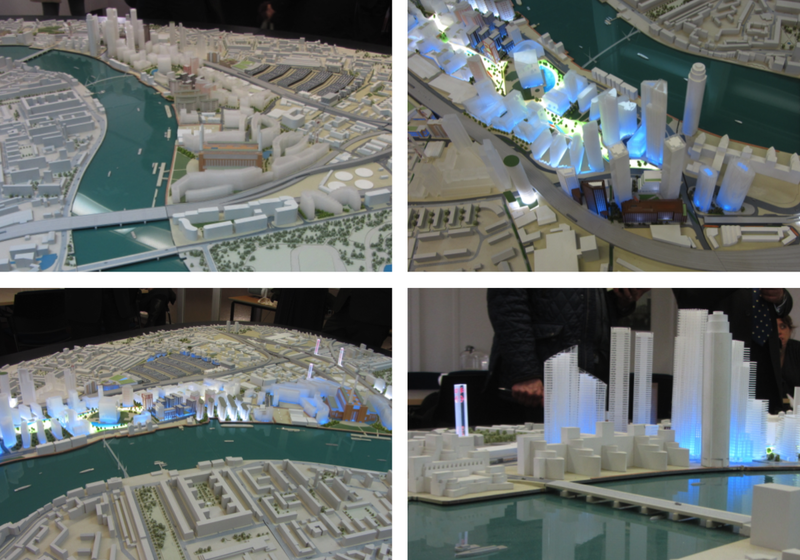 Earlier this week, as part of a promotional walking tour around the Nine Elms, Battersea and Vauxhall area I got to see a the scale model of the plans. My jaw dropped – I knew there was a lot of building work going on but I had no real concept how bullying and oppressive the scale would really be. At the moment there is one very tall boring glass tube near Vauxhall station – you may recall that a helicopter crashed into it last year. Well, hold on to your hat – there are going to be plenty more tall buildings like that – pilots; take note! The local councillors who were there, outlined the regeneration scheme and talked about iconic buildings and creating community (note: iconic buildings are not created; they become so, and community is not created; it evolves). A skinny little grassy space will meander through the area intended to create environments for outdoor events, markets, fairs etc which will "link the town centres". Towns? As far as I am aware 'Vauxhall town centre' is a train, tube and bus station. Where is the library, town hall, butchers and post office? It's got a nightlife though – there are over 20,000 people going there every weekend for the clubs and bars in the arches area. It's really 'Club Town', I suspect, due to the demise of the nightclub scene that used to be at Kings Cross. I was not surprised to learn that retail spaces are planned for the ground floor of these new buildings, so expect to find all the same things you see everywhere else such as large coffee chains and express supermarkets with those annoying self-service check-outs. I doubt there will be any shops there selling normal things like groceries, haberdashery, hardware etc. Or pound shops for that matter. I asked how much of this huge scheme had been sold already and got a woolly politician-style response. When I asked if the local community been involved in the plans, again, I got no real answer, just that there will be schools and health centres. Oh, so that's OK then. The build is already underway, using glass from the US. I find it scary how so many enormous structures can be erected in one swathe. Nothing is allowed to evolve these days. 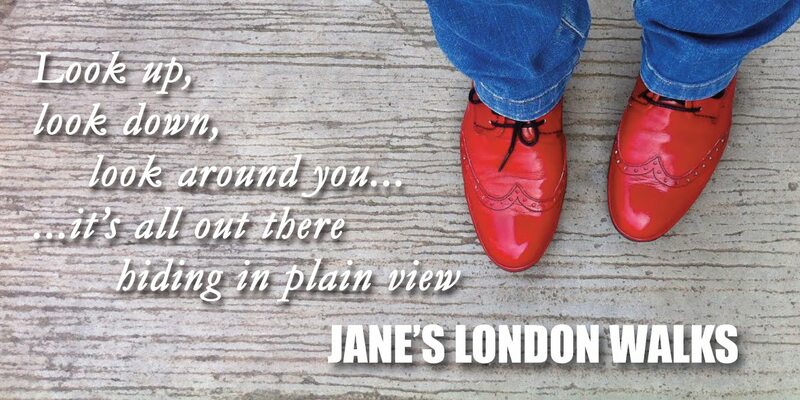 What they are building here is, I think bigger than the City of London – a pop-up, slot-together 'Meccano' world. But there are plenty of empty office spaces available in London, even in the pointy thing... so why build more? Just because there is a large piece of land that doesn't mean something big has to be built on it to fill the available space. It is beyond me how they can start with a blank canvas and yet still end up with a spider's web of outdoor areas that not that much different from high-rise housing estates of the 1970s. And, regarding 'community', do the developers ever think to revisit the areas they have 'regenerated' 5, 10 or 15 years after to see if a community vibe has indeed taken hold? Has anyone been to the Isle of dogs lately? If Ian Nairn was still alive today he would be as agitated by this as I am. Everything will end up looking like Dubai – a sea of glass and metal. Soon there won't be any details for me to find at all and the only things I will write about here will be rants about glass and loss. For balance, here's Nine Elms' official site so you can hear their side. Actually, speaking of Ian Nairn... His series of programmes and his books about how he cared so much about the buildings around him just show that you don't have to be an architect to be interested in or have a view on or a love of architecture and how it makes us feel. If the BBC would like to make a similar series of programmes with a caring, opinionated, woman driving around the UK in an old Morris Minor... then look no further... I am here. 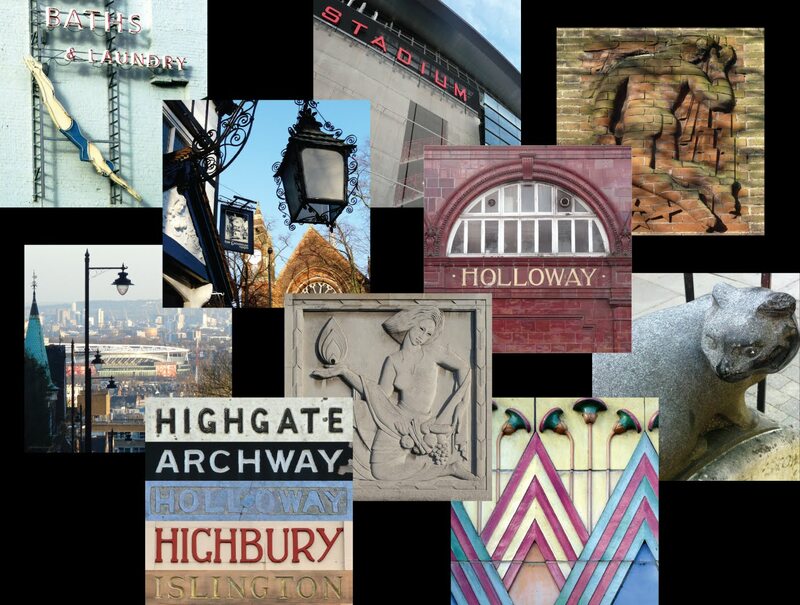 For more of my posts in this vein London's please enter 'architecture' the search box top left.